Source: Saudi Aramco via EIA, here. "Significant progress was achieved in 2010 on Manifa, the giant Arabian Gulf offshore field under development [emphasis mine and please see map and images above -- D.R. ]," Saudi Aramco said in its 2010 annual review, published on Monday (June 6). "Project elements completed during the year included all drilling islands, as well as the main and lateral causeways. Construction of the Manifa Central Processing complex has begun, with the main spine and process area pipe rack completed. The Manifa development will accommodate a Central Processing Facility with gas-oil separation, wet crude handling, crude stabilization, gas gathering and compression, produced water disposal, water injection and other related facilities. 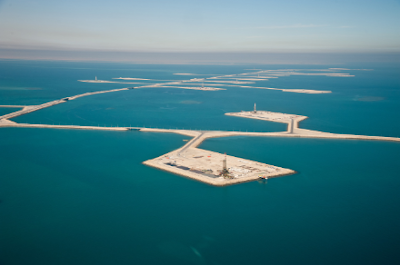 Field development includes 41 km [25 mi] of causeways and 3 km [1.9 mi] of bridges to support 27 [man-made] drilling islands for the shallow water wells, and 13 offshore platforms for deeper water producing and water injection wells. Onshore facilities include 15 drill sites, a Central Oil and Gas Processing Facility, water supply wells and injection facilities, and multiple gathering, water injection, and product transportation pipelines," it added. "Manifa is designed to produce in staged increments --- 500,000 [barrels per day] bpd of Arabian Heavy crude oil by 2013 and 900,000 bpd by 2014," the report said. And output "will be used as feedstock for planned refineries in the Kingdom [i.e., for two new deep-conversion refineries at Jubail and Yanbu -- D.R.]." The Manifa Drilling Team set a new record in December 2010 when it finished drilling the longest well in Saudi Arabia to a total depth of 32,136 ft (± 9.8 km) and completed a horizontal power water injector across the Lower Ratawi reservoir. Calgary Precision Drilling rig did the work on the Manifa well. The same drilling team set an earlier record while working on the 30,850 ft (+9.4 km) Manifa well. Discovered in 1957, Manifa field is in shallow waters southeast of Tanajib, about 200 km (124 mi) northwest of Dhahran. The oil production started when the C reservoir came on stream in 1964, and the B reservoir was brought on production in 1974. Manifa produced heavy crude oil with about 27° API gravity. The field was shut in during January 1984, due to low demand with less than 1% of the reserves produced (Saudi Aramco Journal of Technology, Summer 2009). Development strategy of Manifa, the world's fifth-largest oil field, is based on optimum use of onshore drilling. Instead of developing Manifa completely from offshore platforms, it is developed from 27 offshore man-made drilling islands connected by a causeway, in addition to onshore drill sites and offshore platforms. Extended-reach wells such as the two mentioned above are required for optimum field coverage. "Manifa field is located in shallow and environmentally sensitive waters, necessitating maximizing drilling from onshore sites while minimizing offshore platforms," the report argued. Actually, the state-of-the art extended reach drilling (ERD) technology reduces the high capital and operating costs of large offshore structures (jackup rigs or shallow water rigs, with legs that reach the bottom of the sea floor) and at the same time minimizes the environmental impact in this sensitive near-shore area. "The Kingdom's longer-term concern is over whether it needs to increase oil production capacity to meet likely future demand. The Saudi view on oil markets has altered sharply from where it was a year ago, when a battered global economy was still limping out of recession. Riyadh thinks medium- to long-term oil demand growth may be higher than it had previously anticipated, driven by China, India and also Middle East itself, and discussions are now taking place on whether the Kingdom should raise oil output capacity beyond its current 12.5 million b/d," Petroleum Intelligence Weekly (PIW) said in its article "Saudis Consider Need to Raise Output Capacity." "Now, while no decisions have yet been made and while work is unlikely to start this year, expansions at Shaybah, Manifa and Khurais are back on the table," it maintained. "Aramco has already decided to bring forward the 10 billion- 14 billion bbl Manifa project, and could now expand its capacity from 900,000 b/d to 1.2 million b/d," the article said. During the May 2010 Offshore Technology Conference, Zuhair Al-Hussain, Aramco vice-president, drilling and workovers, said production from Manifa will start in mid-2013 but will not ramp up quickly to the original target of 900,000 b/d of Arab heavy crude (Oil & Gas Journal via my post).